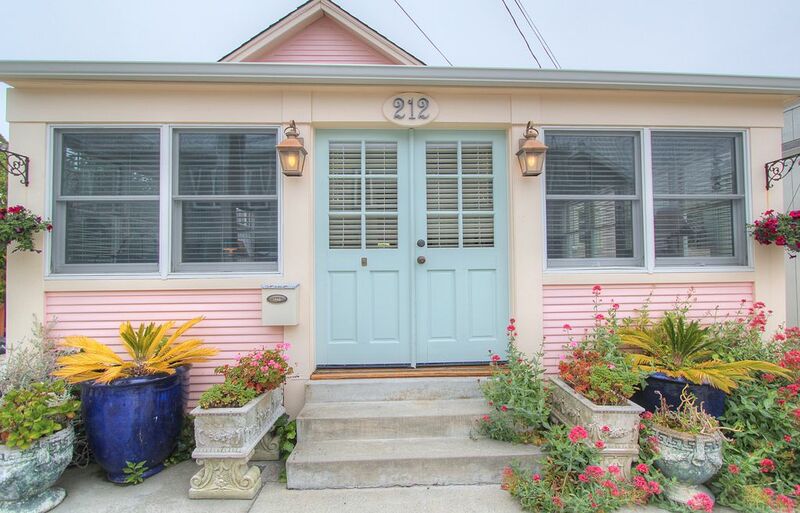 The Capitola 'Rose Cottage' is located in the heart of the village. One block to famous restaurants, shopping and Capitola Beach. Step into the pages of Cottage Living and enjoy all the amenities that this restored historic beach cottage has to offer. Designer touches throughout the property. Recently remodeled with wide plank pine flooring, rough hewn open beams and smooth plaster walls. Have your coffee in the sun filled kitchen and afternoon nap on the sunny front porch. The home features a sun filled back deck and yard for outdoor dining and entertaining with gas BBQ and two eating areas. Garden offers roses and lush Hawaiian greenery. Beach toys, chairs and towels make you ready for the beach with an outdoor shower for rinsing off after. Enjoy the flat screen TV and DVD player in the living area and let the kids watch their favorite show on the porch. Secured WiFi. The house is equipped for all your dining and cooking needs if you don't feeling like eating out on the town. Both bedrooms are cottage style right down to the quilt at the end of the bed. Our sleeping porch, fully closed in with double paned windows has an alcove with 2 twin beds and seating area. Master Bathroom with shower over tub with a classic sitting clawfoot tub, 2nd bathroom , 3 piece with a shower. 1/2 a block to Capitola Village where you will find shops, boutiques, surf lesson, restaurants and bars. Capitola Beach is 2 blocks from the Rose Cottage. Off street parking for one car, Beach chairs,Boogie Boards,Beach towels and toys included Out door shower for post beach rinse off. Large outdoor entertaining area with ample seating. 5 girlfriends had a lovely time here for a long weekend. Charming cottage with everything you need, close to restaurants and the beach, beautiful weather. We loved it! Absolutely charming and cozy! The cottage has so much character and the back yard is quiet and relaxing. Right in the center of the village. Close to shops, and restaurants. A perfect vacation home for our family. We really enjoyed our stay at in this adorable Rose Cottage. We had an amazing week in this beautiful Rose Cottage.I Ioved this home.. And would absolutely stay here again. If you are into the Village of Capitola you can walk everywhere.... Perfect spot. Great house and lovely patio, short walk to the beach, and wonderful hosts make this my favorite place to stay in Capitola. We had a wonderful time at the Rose Cottage. The house was so cute and was very comfortable. We had a great week in Capitola. The Rose Cottage had everything that we needed for our stay. Most places require guests to bring linens and towels. The Rose cottage was stocked with both of these. The back yard was so convenient for gathering with other family members visiting Capitola. Very cute, comfortable house. Charming cottage near Capitola Beach and downtown shops! This cottage was perfect for our girl's beach getaway! We loved everything from the location to the cozy decor. It sleeps 6 comfortably and having two bathrooms for all girls was a life saver! We cooked, played games and enjoyed the beautiful backyard which was filled with blooming roses. The shops and beach are steps away from the front door. The local shop owners are friendly and Capitola Beach is perfect for putting your toes in the sand and water. We decided we will make this an annual trip. We love "Rose Cottage" and can't wait to go back! Capitola Rose Cottage is conveniently located. Walk to local surf breaks in the village or pleasure point. Ten minutes to the Beach Boardwalk, Municipal Wharf and world class golf. Close proximity to Wine tasting in the Santa Cruz mountains. Carmel by The Sea and Monterrey Bay Aquarium just 40 minutes away. San Francisco and Napa Valley 2 hours of easy driving.